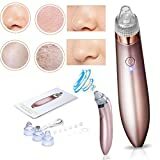 【POWERFUL BLACKHEAD REMOVER& PORE VACUUM SUCTION 】Effectively removes the oil, impurities and dust particles in the large clogged pores; Removes blackhead, grease and acne; Increases blood circulation & skin elasticity, exfoliates dead skin, tightens up loose skin, lessens wrinkle, shrinks pores, smooths your fine lines and makes your skin look more radiant..
【4 CHANGEABLE FUNCTIONAL HEADS】Includes 1 x Large circular hole head for strong suction, 1 x Small circular hole head with gentle suction for sensitive skin area, 1 x Microcrystalline dead skin exfoliation head, 1 x Oval hole head for enhanced nose blackhead removal..
【3 LEVELS OF SUCTION POWER】 Easily adjusted to appropriate suction levels for different skin areas. 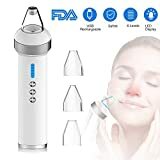 Lower level can be used for sensitive skin, Medium level for small blackhead and High Level for big blackhead or pores..
【LIGHTWEIGHT, RECHARGEABLE AND PORTABLE 】This blackhead remover is extremely lightweight and portable enabling you to easily take it with you to spas, beauty parlors or for use at home.No need to worry about replacing batteries, this blackhead remover has a built-in USB rechargeable lithium battery.And you could use USB cable to charge it everywhere..
【100% User Satisfaction Guarantee】Because we value you, we only deliver the best blackhead remover to you. In case of any faults or defects contact us immediately!. 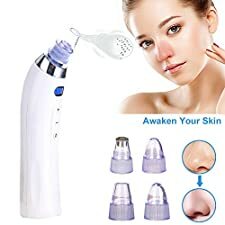 POWERFUL BLACKHEAD REMOVER& PORE VACUUM SUCTION：The blackhead remover has more powerful suction and can cleansing of your skin deeply, effectively removes the oil, impurities and dust particles in the large clogged pores; Removes blackhead, grease and acne; Increases blood circulation & skin elasticity, exfoliates dead skin, tightens up loose skin, lessens wrinkle, shrinks pores, smooths your fine lines and makes your skin look more radiant..
4 CHANGEABLE FUNCTIONAL HEADS：Includes 1 x big round probe to remove blackhead, 1 x small round probe for soothing sensitive skin, 1 x oval probe to reduce wrinkles and 1 x big round thick probe to exfoliate dead skin and calluses..
4 LEVELS OF SUCTION POWER：The blackhead vacuum is designed for a variety of skin types.Comes with 4 adjustable suction pressure intensity levels of green, blue-violet, red and yellow to easily clean large oil pores, completely remove blackheads and reduce wrinkles..
LIGHTWEIGHT, RECHARGEABLE AND PORTABLE：This blackhead remover is extremely lightweight and portable,you could enjoy your professional SPA skin care at home or traveling. Built-in USB rechargeable lithium battery lasts over an hour on a full charge..
GREAT WARRANTY FOR YOU：Because we value you, we only deliver the best blackhead remover to you. In case of any faults or defects contact us immediately! We will refund the amount equal to the purchase of Blackhead Remover or send you a new Blackhead Remover to ensure that you are 100% satisfied. SCROLL UP AND CLICK THE YELLOW ADD TO CART BUTTON TO BUY NOW!. DOLLVE PREMIUM QUALITY BLACK HEAD REMOVER TOOL with strong suction WILL effectively remove blackheads and acne, reduce wrinkles, exfoliate dead skin, tighten up loose skin and keep you looking radiant!Why Purchase This Powerful Pore Vacuum Acne Suction Exfoliating Tool From Us!POWERFUL BLACKHEAD & PORE VACUUM SUCTIONEffectively removes blackheads, cleans pores and reduces wrinkles.4 ADJUSTABLE INTENSITY LEVELSEasily adjust the blackhead removal machine to suit your skin, thereby eliminating the risk of injuries.SAFE Manufactured to meet health and safety standards. 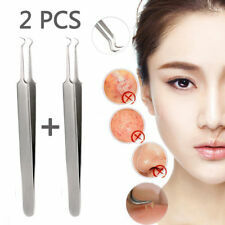 Comes with soft probes to eliminate the risk of bruises and marks on the skin.4 MULTIFUNCTION PROBESIncludes 1 x big round probe to remove blackhead, 1 x small round probe for soothing sensitive skin, 1 x oval probe to reduce wrinkles and 1 x big round thick probe to exfoliate dead skin and calluses.100% MONEY BACKDON'T SETTLE FOR THE KNOCKOFF blackhead remover tool kit sold by some unethical sellers. All our electric blackhead remover machines are backed by a NO QUESTIONS ASKED warranty.NOTE:Do not stay fixed on one position for more than 3 seconds. DO NOT start with a high intensity, instead, start with a lower intensity and gradually increase the pressure.GET RADIANT AND GLOWING SKIN, ELIMINATE BLACKHEADS AND ACNE TODAY WHEN YOU ORDER NOW!